The Daily Sentinel in Iowa has an outstanding article on the U.S. Department of Agriculture conducting counterinsurgency in Afghanistan. Kingsley native Jeff Knowles looked down at the protective flak jacket, then turned to the soldier next to him. Body armor is not in Knowles’ typical wardrobe as an employee of the United States Department of Agriculture (USDA). But then again, working with farmers in Afghanistan to help rebuild their agricultural system isn’t his typical work either. Knowles, who now lives in Hawaii, spent six months in the war-scarred nation talking with farmers about what they grow and what their needs are. He was honored last week by USDA secretary Ed Schafer for his service in Afghanistan in 2005-06. Knowles’ travels were part of a partnership between the USDA and the U.S. Department of Defense in their campaign to “win hearts and minds” of the Afghan people. Living conditions are rough. And most farmers are subsistence farmers, growing crops like wheat, potatoes, onions, tomatoes, apricots, apples and almonds. It was in Hawaii that Knowles decided to volunteer for a six-month stint in Afghanistan. The USDA is still sending people to Afghanistan as well as Iraq to help people stabilize their farming economies. The entire article is worth the read. The DoD and USDA are to be commended for this innovative use of soft power to win hearts and minds. If kinetic operations have been languishing (and are helped by the presence of the Marines in Helmand), at least one element of soft power has been implemented. The State Department should watch and learn, and then follow the lead of the USDA. This has given us a good example of what soft power can accomplish in counterinsurgency. 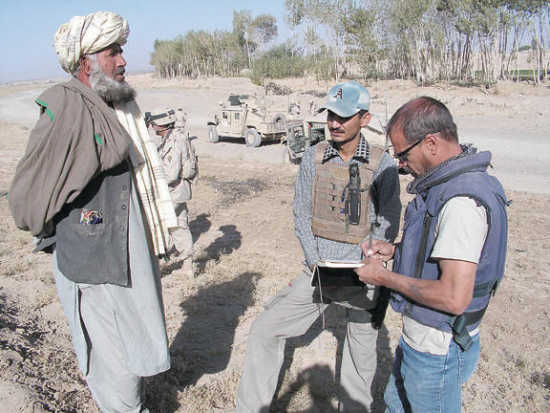 Jeff Knowles, far right, a native of Kingsley, interviews a farmer in southern Ghazni province of Afghanistan. Knowles, an employee of the USDA, spent six months in Afghanistan working to help stabilize the farming economy. This month, the U.S. Secretary of Agriculture honored Knowles for his service there. You are currently reading "The U.S. Department of Agriculture Does COIN", entry #1096 on The Captain's Journal. This article is filed under the category(s) Counterinsurgency,Soft Power and was published May 13th, 2008 by Herschel Smith.